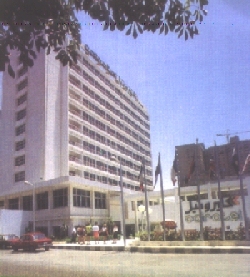 The Cairotel offers 144 luxurious twin-rooms and 18 deluxe suites. Most rooms have an exquisite view of the Nile. All rooms and suites are elegantly furnished with private bath, radio, color TV, video program, telephone, mini fridge and central air conditioning. Number Of Rooms 144 Luxurious twin-rooms & 18 Deluxe suites. - Spacious and luxurious public areas.